from which she never waivered. Kerri knew she wasn’t alone in her despair. “There’s a lack of resources available to women,” she says, before adding that she could only imagine how other mothers – who weren’t a part of the medical world – were feeling about it. Determined to find a way to “teach and help patients prepare for breastfeeding prior to the birth,” Kerri spent her spare time taking extra courses. “I wanted to take my experience and help others,” she explains. 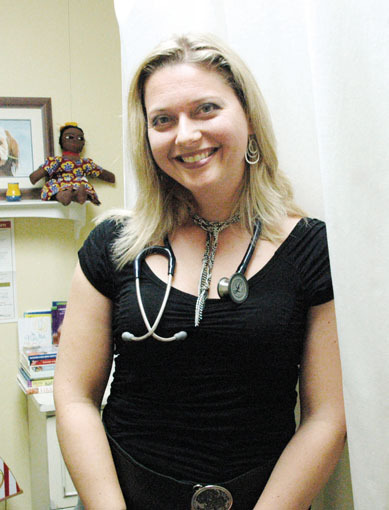 Now, as part of the Medical Associates of Port Perry, Kerri works as a family physician while living out her dream of specializing in women’s health issues through teaching breastfeeding education and doing routine lactation assessments at the hospital. Kerri was granted her first opportunity to work in medicine in grade 13. For her co-op program she was able to work in the hospital doing obstetrics, which is a practice that focuses on caring for women and their babies during pregnancy. 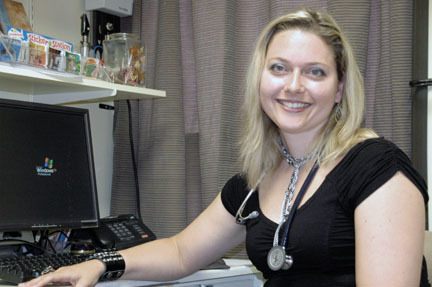 She decided that working as a family doctor was more appropriate for her. “A family practitioner allowed me to do everything, to see it all, to be a part of my patient’s lives for the whole journey,” she explains. “And I enjoy the variety that comes from having all types of people in my practice,” she adds, referring to her treatment of men, women and children. Kerri began her medical training at McMaster University and she completed her ‘rural residency’ program (work placement in hospital/clinic) out of the University of Toronto. While her first year of residency was spent rotating among Toronto’s hospitals, she decided to come to Port Perry, like many of the other ‘Docs,’ for her second year of residency. But Kerri says she “always missed being in Port Perry.” After her daughter was born, they decided to move back and “there was no looking back!” she assures. Kerri decided, especially after witnessing how valuable life is through her work, family needed to come first. She wanted to be more involved in her children’s lives and so she decided to dedicate some of her time to establishing “a presence in their school,” through volunteering in the classroom, assisting teachers and reading to students. Aside from working in the classroom, Kerri is also secretary of the parent council at S. A. Cawker School and she is heavily involved in developing a program called Mothers in Touch, which happens to run in many communities and branches off according to school. “The hardest part is finding the time, but I’m determined!” she insists. Mothers in Touch, she explains, “Allows moms to come together and pray for their kids.” Each meeting is based around a different focus, such as “school bullying” or “purity” and the women will gather together while Kerri leads them in prayer. “It provides an extra cushion for doing all you can for your kids’ safety,” she says. Kerri says, in times of struggle, she is lucky to be able to lean on her husband for support. “He understands the ups and downs in medicine,” she explains, referring to his job as a paramedic. “He understands when I come home and can’t shut my brain off.” His encouragement, along with her adoration for photography, allows Kerri to stay afloat when the emotional burdens of being a doctor become overwhelming. As part of her motto to “embrace life,” Kerri uses her camera to explore and chronicle the things that make her feel content. Her subject of choice? “I like to find beauty in the simple things,” she notes, while expressing her delight for photographing nature and her family. Kerri describes herself as a very sentimental person and she believes this quality is the reason for her devotion to practicing family medicine. After losing her sister at a young age, Kerri says she has a “depth of sympathy that makes her more emotionally involved with her patients.” “When they cry, I cry. When they’re in pain, I’m in pain. When they’re happy, I’m ecstatic!” she says. This strong connection to her patients, as well as the desire and willingness to help them “throughout the journey” has led Kerri to make herself as available to her patients as possible. She designed and manages her own website and encourages her patients to keep in touch with her through email.